Item. Queen Thyra commanded Matthias Grunwold to appear before her and take Oath as the Captain of her Guard, and to present to her the other members of her Guard to receive emblems of their station from her hand. Item. Their Majesties summoned Baroness Avelina Keyes of Lockwood, lately Queen to King Kenric now deceased. To ensure peace in the realm and the protection of the said Avelina and her minor daughter, and to further confirm the Treaty by which the said Avelina renounced all claim to the Tyger Throne, Their Majesties caused the said Avelina to be wed to Kenric of Essex, cousin and heir of the late King Kenric of blessed memory. Their Majesties further endowed the said Kenric of Essex with the title of Earl and gifted him with the ensigned and illuminated Chronicles of King Kenric prepared by Aelgifa of the Hazel Thicket. Item. 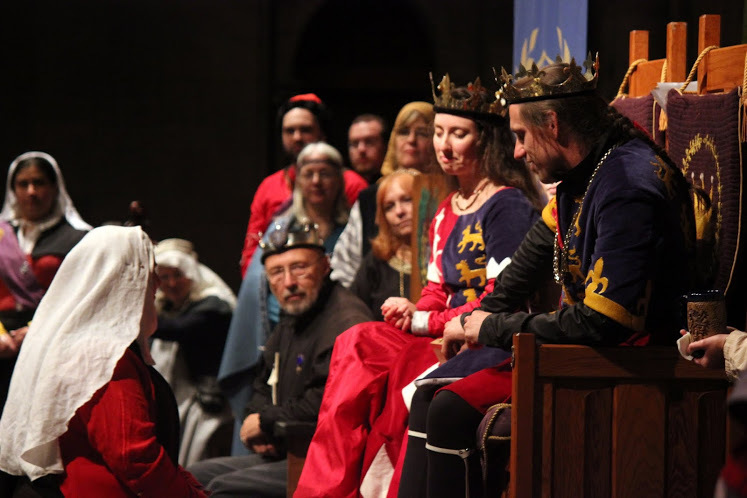 Their Majesties then heard testimony from the Ladies of the Rose and from worthies from the Orders of the Chivalry, Pelican and Laurel. 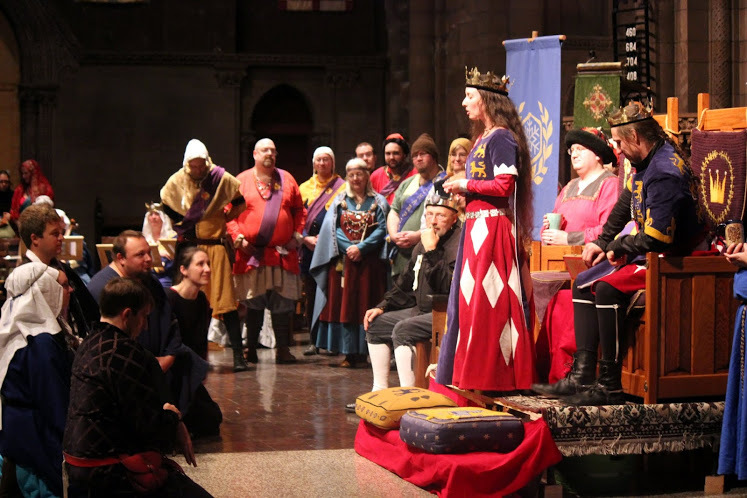 Upon the said testimony, their Majesties did then invest and endow Avelina Keyes of Lockwood with the estate of a Countess and a Lady of the Rose, the which action was memorialized in a document by Nest verch Tangwistel. Item. 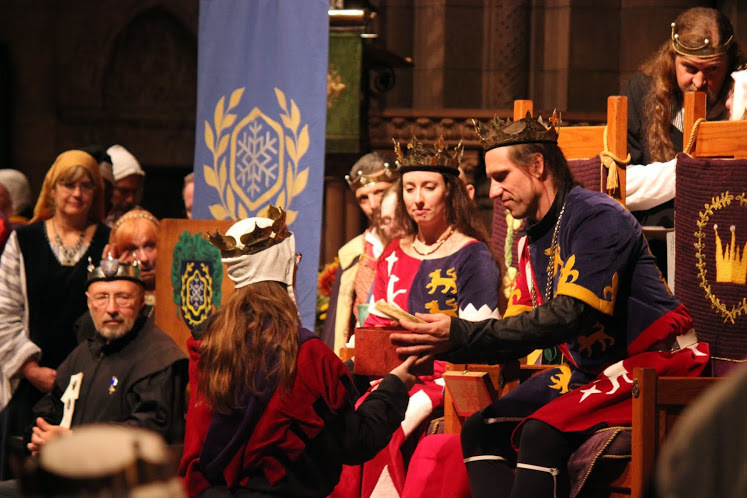 Their Majesties accepted the fealty of Brid nic Shéarlais. Item. 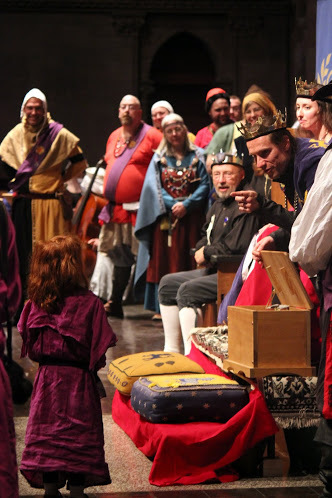 Their Majesties summoned the children of the East Kingdom and shared with them toys donated by Alisay de Falaise and her apprentices, known as la Chambre des Dames d’Alisay. Item. Her Majesty summoned her household, Darostur, to thank them for their support and hard work. Item. Their Majesties awarded Arms to Sergei Rostvad syn, memorialized in a document by Eowyn Eilonwy of Alewife Brook. Item. 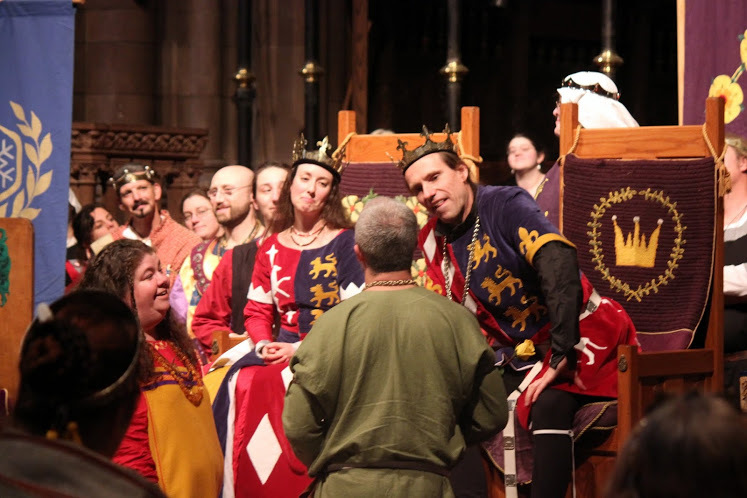 Their Majesties awarded Arms to Katherine Morgan. Item. Their Majesties awarded Arms to Æsa feilinn Jóssursdóttir, memorialized in a document by Katherine Stanhope. Item. Their Majesties summoned Samuel of Lochleven and Mechtild Welandstochter, and did then award them both Arms. Samuel received a document memorializing his elevation by Harold von Auerbach; Mechtild received the same by Chrestienne la pescheresse. Item. Their Majesties summoned Alec Craig and awarded him Arms, as memorialized in a document by Henna Sinclair. Item. 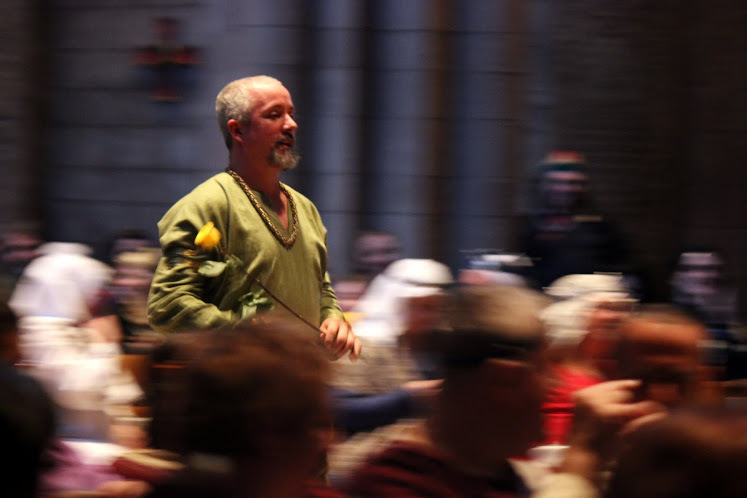 Their Majesties requested the presence of Magnús hvalmagi and, praising his story-telling abilities, did induct him into the Order of the Troubadour, as memorialized in a wooden rune-stone prepared by Anastasia Heinrich. Item. 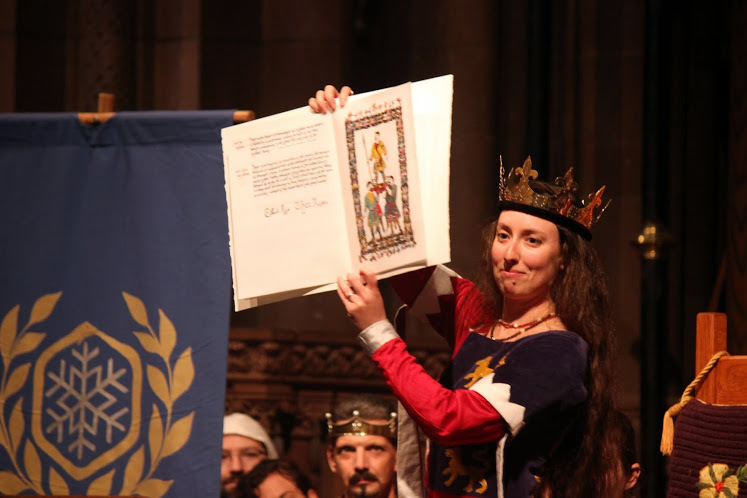 Their Majesties called before them the College of Performers and caused the guild’s Charter to be read aloud and marked with their signatures. The Charter was composed by Tristan le Chanticler de Champaigne and inscribed by Isabel Chamberlaine. Item. Master Justin du Coeur appeared before Their Majesties to petition for the appropriate disposition of his protegee, Caitriona of Greenwood Isle, who, by dint of her many labors, had been distracted from her party-finding duties to the said Justin. Their Majesties then summoned forward the Order of the Silver Crescent and inducted the said Caitriona into the aforesaid Order. Caitriona’s induction was memorialized in a document by Constance de St. Denis. Item. The Order of the Silver Crescent being still incomplete, their Majesties summoned Lorita de Siena and inducted her into the aforesaid Order for her works. This deed was memorialized in a document by Palotzi Marti. Item. The Order of the Silver Crescent being as of yet still incomplete, their Majesties caused Deonna von Aachen to be brought before them and added to the rolls of the aforesaid Order. This deed was memorialized in a document composed in Latin, with a musical setting, by Arden of Icombe. Item. Baroness Katarzyna Gwozdz, known to many as Varju, appeared before Their Majesties with a letter and a gift from Master Iheronimus Bruckner. Master Iheronimus created and gifted to Their Majesties seals for the Kingdom bearing the East Kingdom arms and seals for their personal use bearing their personal arms. Item. 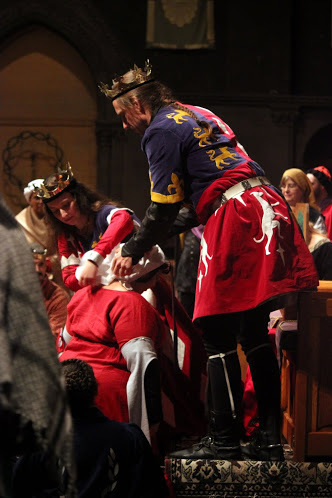 Mistress Jadwiga Zajaczkowa and Baroness Annys Wolf of Wharram Percy of the Guild of Herbalists and Apothecaries appeared before Their Majesties bearing gifts from their Guild. Baroness Annys’s ascension to the office of Guildmistress of the aforesaid Guild was announced. Item. 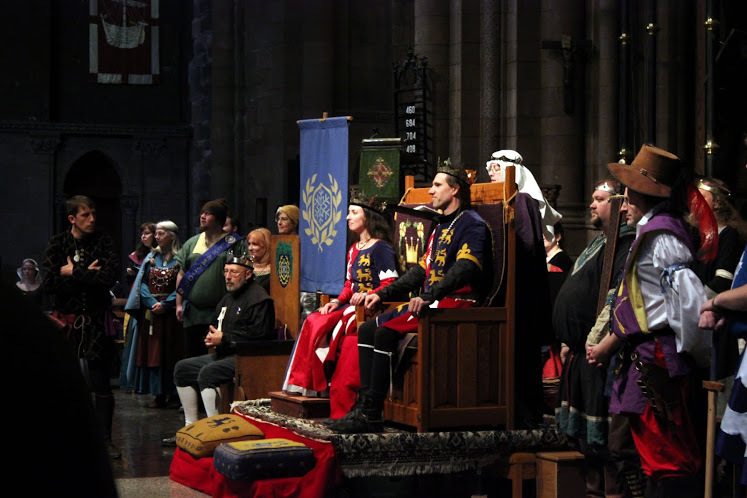 Brunissende Dragonette de Broceliande, Kingdom Minister of Arts and Sciences, was summoned before their Majesties, whereupon their Majesties caused the Order of the Pelican to assemble before them. 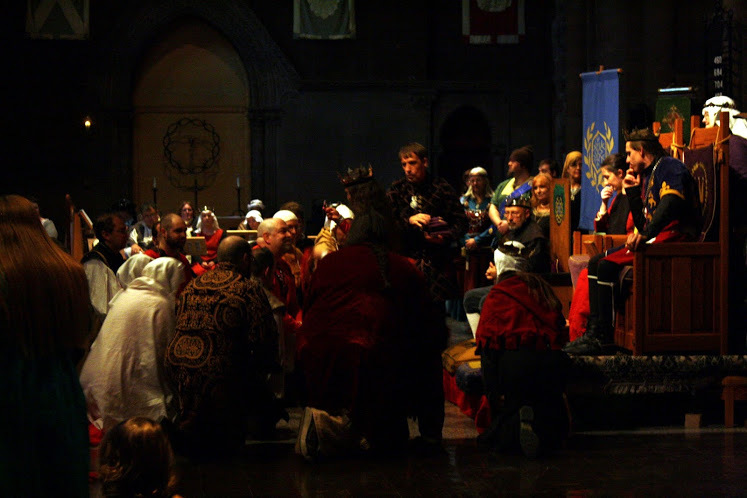 The said Brunissende was commanded to appear at Twelfth Night, upon 5 January, in the Barony of Iron Bog, to sit vigil for elevation to the Order of the Pelican. Their Majesties did cause to be served upon the said Brunissende a Writ bearing their command authored by Alys Mackyntoich and Alexandre Lerot d’Avigne in the language of her homeland and inscribed by Isabel Chamberlaine. Item. Their Majesties then instructed Master Tanczos Istvan to bring forth Marie de Blois to attend upon the words of Their Majesties and the Order of the Pelican. The said Marie was likewise commanded to appear at Twelfth Night in Iron Bog upon 5 January to sit vigil for the Order of the Pelican. The said Marie was served with a Writ commanding her attendance authored by Alys Mackyntoich and inscribed by Tanczos Istvan. I do hereby bear witness and upon the strength of my signature confirm that the aforesaid was done upon 13 October, in the forty-seventh year of the Society. 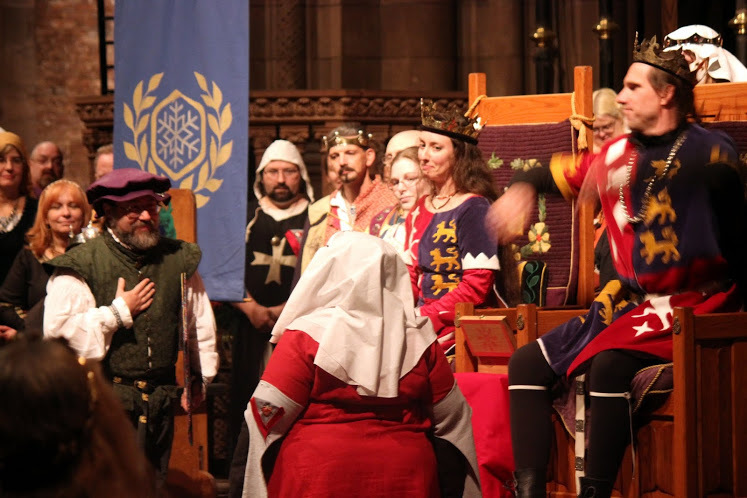 Thanks to Mistress Alys Mackyntoich for providing this account of Their Majesties’ Court. All photographs by Baronne Cateline la broderesse.